I wasn’t much of a student at school, but I do remember some of the things my teachers tried to get into my head. For instance, I remember the intriguing story of how Copernicus dared to think differently, and as a result succeeded in turning cosmology inside out. 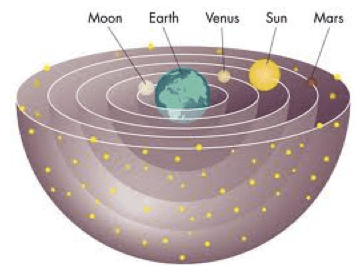 Up to that time the scientific community thought that the earth was the centre of the solar system, and that the sun, moon, and planets revolved around her. In about 1510 Copernicus wrote a thesis in which he contradicted Ptolemy’s notion of a geocentric solar system. His careful observation and calculations had revealed that the Sun, and not the Earth, was at the centre of things. The Sun did not revolve around the Earth; instead the Earth and the other planets revolved around the Sun. What a shock that must have been to the scientific world. The religious world also went into shock and immediately declared it a heresy to claim that things did not revolve around our world. We chuckle now, and shake our heads condescendingly, but in a sense much of the church still lives in a pre-copernican spiritual solar system. The Bible declares that the Son of God is the centre of all things, yet many Christians stubbornly hold to the notion that they themselves are the centre. Why do I say this? I say this because so much of current theology and practice is about us, instead of about Jesus. In the evangelical church we decry humanism and liberalism yet we so often preach, write, and attempt to live out an essentially self-cantered faith system. In their book ‘The Jesus Manifesto’ Len Sweet and Frank Viola write, ‘We live in a day where what sells best in the Christian world are books, sermons, and television programs that are aimed directly at you – This Is Your day, You Are the Reason for the Season, Becoming a Better You, It’s Your Time, The Me I Want to Be, The Life You’ve Always Wanted, and similar titles orbiting around the Youniverse’. Phrases I sometimes hear are, “I must discover my spiritual gift”, “what is my purpose?” or “Nobody recognises my ministry. Don’t they know who I am” – I, my, and I. The biblical response is “You are in Christ Jesus, that’s who you are. Your purpose is to know Jesus, be like Him, and help others to do likewise. Jesus’ gifts to His church will manifest through you as and when He wills it”. The way to resolve our lack of self-worth, life direction, or functionality is to focus on Jesus and not on self. In copernian terms this translates to “focus on the Son in the centre of the universe and planet You will orbit wonderfully well”. Do you think this is all rather judgmental or critical? I don’t mean to be and I know that I too am part of the problem because I am part of the church. However, I do think that much of the current Christian planetary arrangement is more a Youniverse than a Him-cantered Son-system? What does your life-planet orbit around?